Hi! Somehow it's already been two weeks since my last 26 Great Nail Art Ideas mani (see my post for 'Spring Animals' here), so today I'm back with another one! This time the theme is 'Green Freestyle'. I thought this prompt would be a perfect opportunity to use my Painted Polish Pantone Greenery duo, which I hadn't yet got round to playing with. I decided to do a quick dotticure. Read on for more info! I started off with a base of the creme from the duo, 'Stamped in Greenery'. 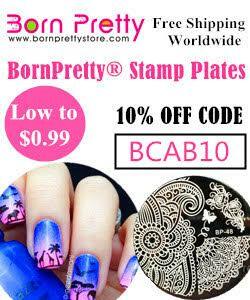 It is also a stamping polish, so is lovely and opaque. Below is two coats with topcoat. I then added my dots using the holographic from the duo, 'Gaga for Greenery'. Using a dotting tool, I fully covered my ring nail in dots. I started off with a single line down the middle, and then worked my way outwards until the nail was covered. I liked how they came out so repeated the process for my pinky nail. Finally, I added a large dot in the middle of my index and middle nails, with smaller dots either side. I chose not to add topcoat as I liked the slightly raised look of all of the dots. What do you think? I'm really happy with the final look - the two polishes go really well together! I haven't actually done many dotticures as I'm convinced I'll mess up the spacing or the sizes of the dots, but I think it went well! I also think simple can sometimes be better, it's far too easy to over complicate a mani. 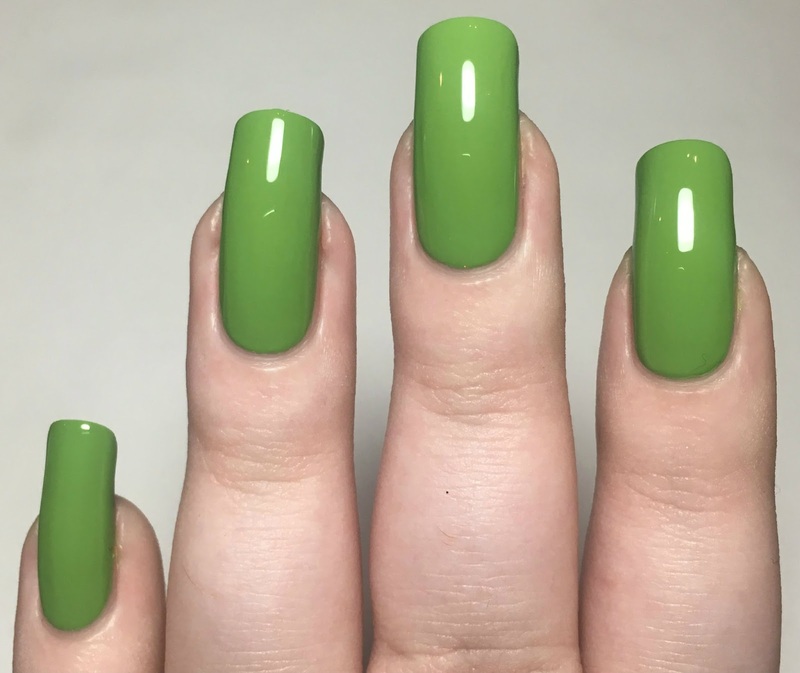 'Stamped In Greenery' is currently sold out on the Painted Polish website, although 'Gaga for Greenery' is available here. Both are available on Rainbow Connection ('Stamped in Greenery' here, and 'Gaga for Greenery' here). I should have my full swatches up soon! Those two polishes look like they were made for each other! Beautiful dotticure- I'm always afraid I'll mess them up, too, but this turned out perfect! Green is very fresh and beautiful mani. These two colours work so well together! I feel the exact same way with dotticures, that I'll mess up the spacing lol. Dotticures are always such a wonderful mani - simple, but classic! Sometimes i just struggle with the spacing with the dots. So pretty! 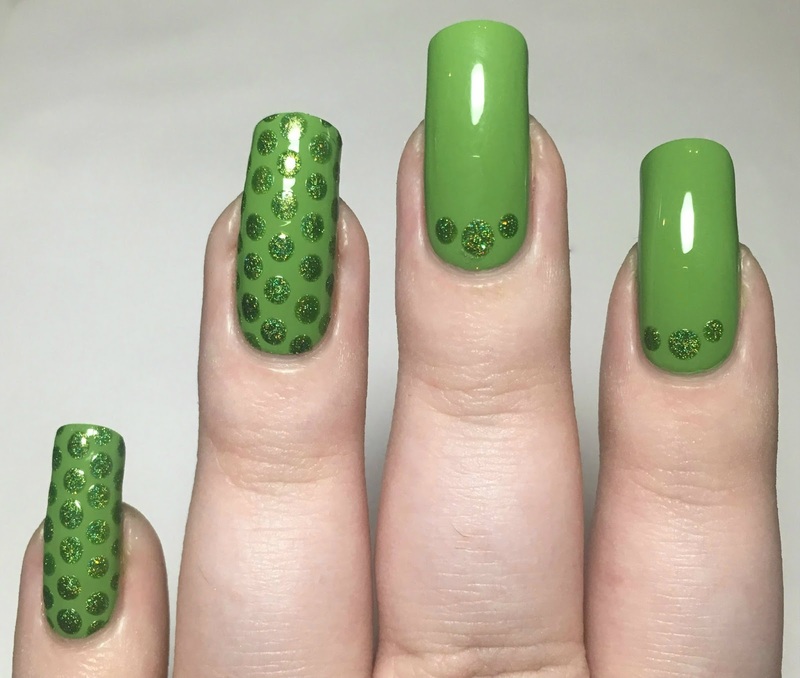 I love the glittery green dots! I love both of these - and your dots are perfection! 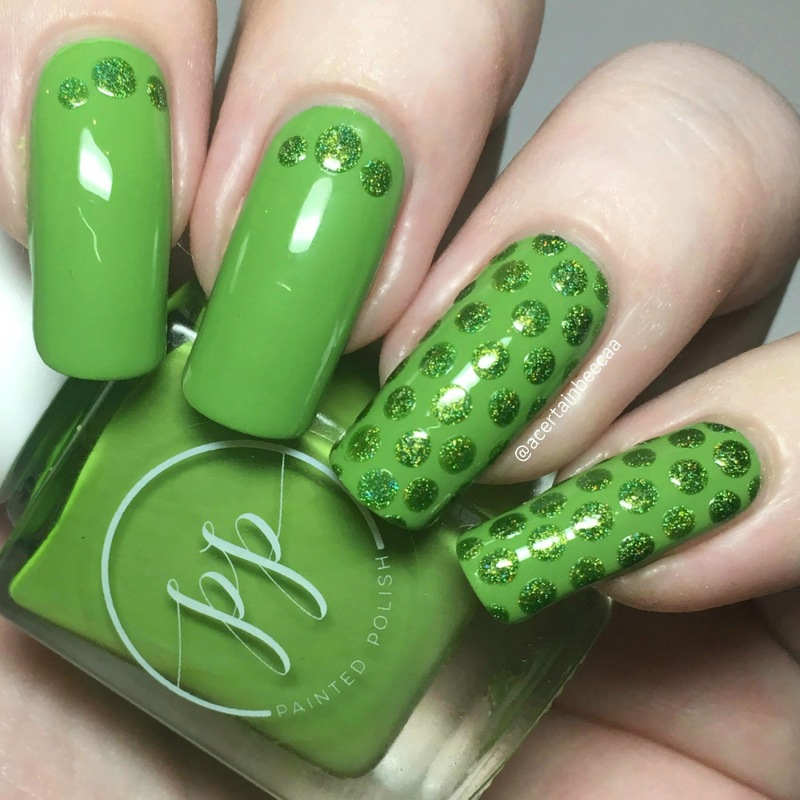 Looking amazing all the nail art, green is so prominently flourish on nails is excellent.